RGB: Just add light RGB stands for the colors red, green, and blue. The RGB model is known as an additive model, where colors are added together to make up what we see on the screen. Basically, pixels on a television set or computer monitor create tiny pixels that, if viewed under a magnifying glass, are one of those three colors. Light is projected through them, blending the colors on the eye’s retina to create the desired colors. CMYK: The printers palette CMYK, on the other hand, stands for the colors cyan, magenta, yellow, and black. CMYK is a subtractive model. This gets a bit complicated, but the idea with subtractive models like CMYK is that colors from the spectrum are subtracted from natural white light into pigments or dyes. These pigments, then, are printed onto paper in tiny little cyan, magenta, yellow, and black dots. If you were to take a magnifying glass to a magazine cover, for example, you would see that the main image is really just a bunch of dots spread out, some closer than others, to appear like the colors we want. Why RGB Colors Need to be Converted The RGB scheme has a greater range of colors than CMYK and can produce colors that are more vivid and vibrant. These colors are beyond the range of CMYK to reproduce and will come out darker and more dull in print than what is seen on the monitor or display. Because the RGB color mode has the full range of colors, documents shown in CMYK mode will always show up precisely on-screen. RGB colors, however, will not necessarily appear in print as they do on-screen. To accurately print the document or image, it must be converted from its original RGB format to CMYK. It is possible to do this by using software such as Adobe Photoshop or Adobe Illustrator. Keeping the Color Correct from Design to Print When you design graphics on a computer for printing, or want to print images from a digital camera, it is a common mistake to assume that the colors seen on the screen will look the same in print. As a result of this mistake, files for printing are often sent in the Red-Green-Blue (RGB) format for printing. The problem here is the computer screen and many photo editing programs show colors in RGB mode, while images are printed on paper in Cyan-Magenta-Yellow-Black (CMYK) format. Sometimes the conversion from RGB to CMYK works without any problems arising, and a printout will look identical to what shows up on the computer. In other cases, there will be noticeable differences between the shades of color. The key to avoiding this potential problem is to convert all graphics to CMYK format during the layout design phase. Quick tip When designing graphics for print always set up your document in the CMYK color profile. When designing for web or working with photographs use the RGB color profile. 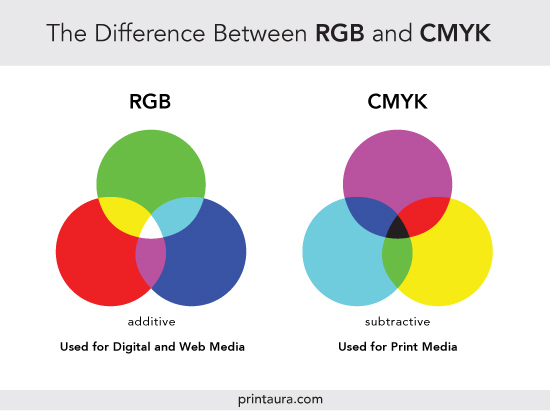 CMYK vs RBG – Cheat Sheet was created by the FirstSiteGuide.com Team. Print Aura prints t-shirts on Kornit brand printers using water based inks in the CMYK profile that are 100% biodegradable, non-hazardous, toxin-free and adhere to the strictest human health and environmental standards including Global Organic Textile (GOTS-3V), Residues Standard List (RSL) and the American Association of Textile Chemists and Colorists (AATCC).